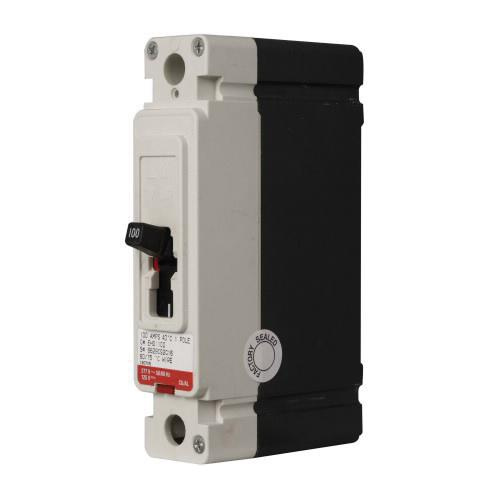 Eaton Type EHD 1-Pole F-Frame molded case circuit breaker is rated at 15-Amps and 277-Volt AC/125-Volt DC at 50/60-Hz. Interrupt rating of this circuit breaker is 14-Kilo-Amps at 277-Volt AC and 10-Kilo-Amps at 125-Volt DC. This 1-Phase thermal-magnetic circuit breaker features high-speed, blow open action for superior performance. It measures 1.375-Inch x 3.375-Inch x 6-Inch. It is suitable for use in panelboard, switchboard, motor control center and busway applications. Panel mountable circuit breaker has standard pressure type load terminals and accommodates wire of size 4 - 1/0-AWG. This non-interchangeable circuit breaker with 100 - 100-Amps trip range, is ideal for reverse feed applications. Circuit breaker is UL listed, CSA/CCC certified, CE marked and meets IEC/IEE/NEMA/VDE standards.